The following is a well-spoken explanation of this chart. At the end of the article ar Youtube videos by David Hawkins also explaining his chart. When I read this book over 15 years ago I was highly impacted by the information – and through a lot of self-reflection, I started to realize how I was raised and how I had been living and reflecting those levels of consciousness – and then made some necessary changes. Use this chart for your own self-reflecting and make necessary changes and use this chart to see where other leaders/people/societies/countries are “coming” from. At PFC we are looking forward to having the scalar mind control taken down, so we can more easily increase our consciousness and live in new societies of higher consciousness. The Map of Consciousness was created by Dr. David Hawkins, a psychiatrist, who experienced several life-altering events throughout his life. Following each event, he noticed a change in his state of consciousness from an ego-based/ mind focus to a completely overwhelming state of overpowering bliss where he felt a constant, steady connection with the “Presence”. 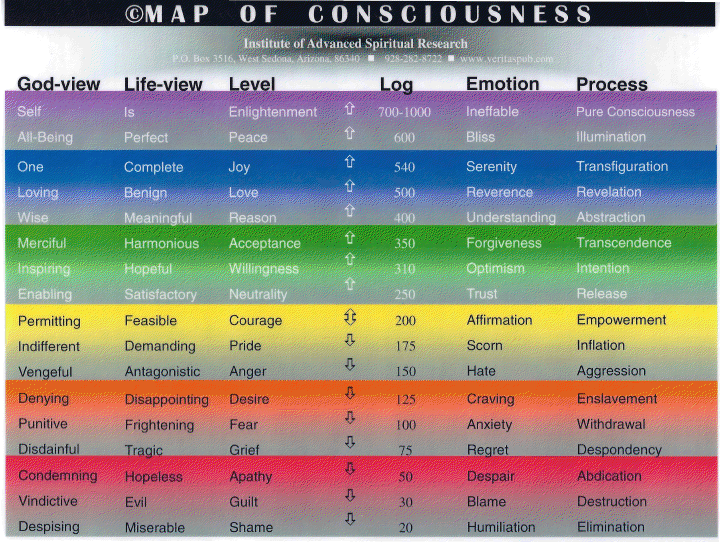 The Map of Consciousness is a numerical scale whereby one can measure positive from negative, power from force and truth from falsehood. Dr. Hawkins believes that every word, every thought, and every intention creates what is called a morphogenetic field, or attractor field, and that these energy fields can be measured by a very simple process. This process is a well-established science known as Kinesiology. Kinesiology is defined as the study of muscles and their movements, especially as applied to physical conditioning. The study of kinesiology first gained scientific attention from the work of Dr. George Goodheart, who pioneered the specialty he called Applied Kinesiology, after finding that benign physical stimuli such as beneficial vitamin and mineral supplements would increase the strength of certain indicator muscles, whereas hostile stimuli would cause those muscles to suddenly weaken. In the late 1970s, Dr. John Diamond refined this specialty into Behavioral Kinesiology where indicator muscles would strengthen or weaken in the presence of positive or negative physical, emotional and intellectual stimuli.